Epic Games is officially making it rain with Fortnite (Free) on mobile. A new Sensor Tower report shows that the game’s revenue is spiking as more players get in, with another spike happening on the day of the invite-only period ending. The starter pack IAP also helped cause a spike in revenue. While there was a dip in revenue, it helped kickstart Fortnite‘s revenue growth. While the grossing charts are hidden on the App Store itself, App Annie shows that Fortnite is the most downloaded game on the App Store, and the top grossing app. Not just the top-grossing game, but the top-grossing app, ahead of Netflix, Pandora, Tinder, and YouTube. The millennials are choosing to play Fortnite instead of Netflix and chilling with someone they just swiped right with on Tinder? SMH. 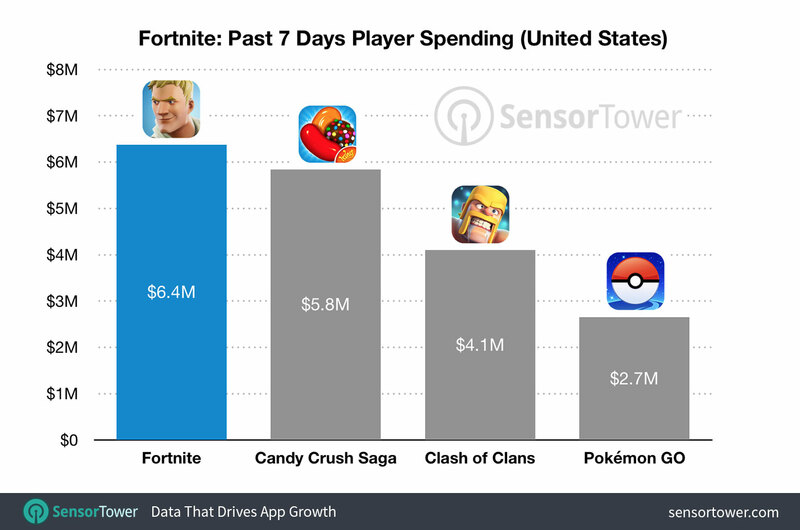 Fortnite‘s past seven days of player spending shows that it pulled in $6.4 million in the past week, and that’s before the game is on Google Play. 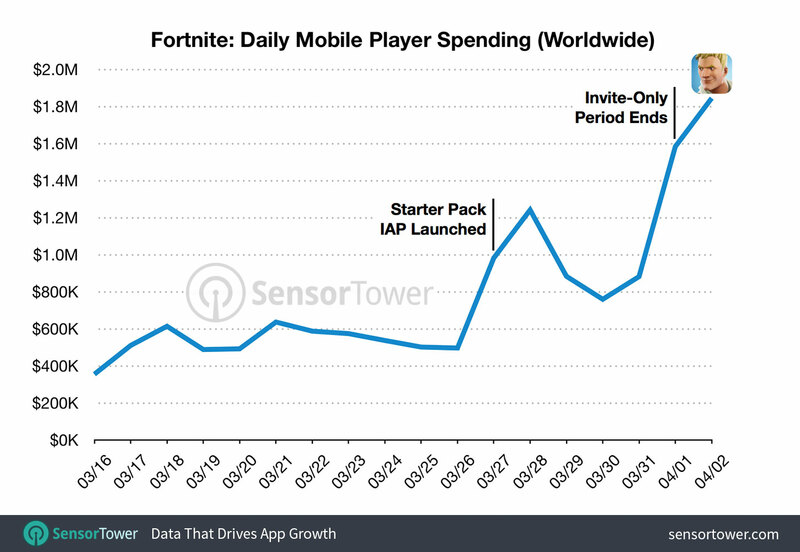 Once that happens, Sensor Tower estimates that Fortnite might make $3 million per day. And that’s not factoring in spending on other platforms. I think Fortnite‘s success raises an interesting question. So, I don’t like “pay to win" as a term necessarily, but it gets the point across. Mobile games have pretty much been based on that – paying to get advantages that would either be time-consuming or difficult to obtain without paying. Fortnite is all cosmetics, but it also makes it so that you really can’t buy cosmetic items without paying. Sure, there are ways to earn V-Bucks, and the Battle Pass is a great way to min-max that V-Buck spending. But Fortnite is making a lot of money on all platforms, and even on mobile it’s making a ton of money, selling a currency that’s only usable on cosmetics. Did monetization experts get it all wrong? Was it possible to build a future of free-to-play gaming without “pay-to-win" this whole time? Sure, Fortnite has a massive player base, but so do all the other games in the grossing chart. Especially consider that loot boxes have been under regulatory scrutiny. Perhaps Fortnite‘s business model is the way forward for free-to-play, and the games industry got it all wrong. Or perhaps much like Crossy Road (Free), while the business model can work for other games, it’s still driven by getting a ton of downloads. And that’s what Fortnite has. (!) Please play the game while the network is connected.